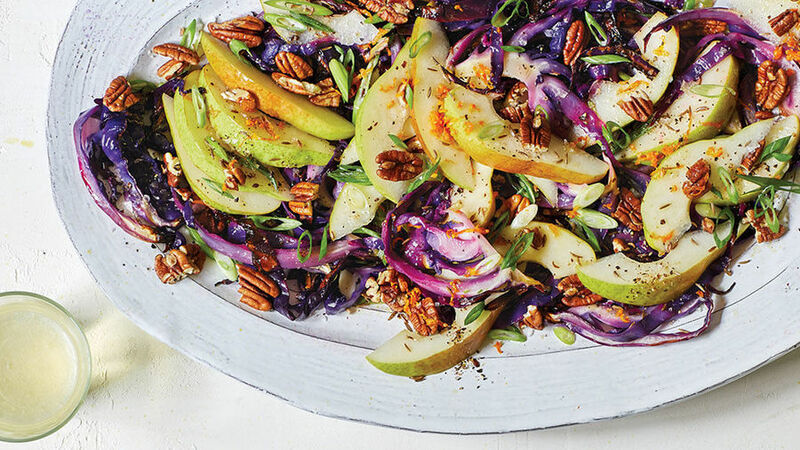 Try this sweet, earthy salad as a side or main dish. A simple yet elegant salad! Position a rack in the top third of the oven and pre-heat the broiler. Line a large rimmed baking sheet with foil, shiny side down and lightly grease the foil with olive oil. Arrange the cabbage slices on the sheet and drizzle with 1 Tablespoon olive oil. Broil until the edges are nicely charred, 10 to 12 minutes. Transfer cabbage from baking pan to a serving platter and let cool completely. In a medium bowl, combine the pear wedges with half the scallions, brandy, vinegar, remaining 1 Tablespoon oil, and the caraway seeds. Toss together. Top the cooled cabbage with the pear mixture and sprinkle with pecans, zest scallions, a sprinkle of finishing salt and a grind of white pepper.